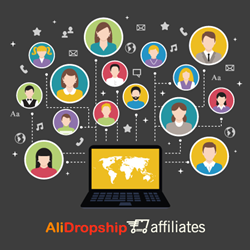 AliDropship Company, already well-known and popular among online entrepreneurs worldwide owing to its key product – AliDropship plugin, – is ready to share its success with anyone wishing to benefit not only from running an eCommerce business, but also from lucrative drop shipping affiliate programs. A long-awaited partnership program has been launched by AliDropship Company. The new program is a great opportunity for the company’s numerous loyal customers and beyond. AliDropship plugin continues to gain popularity among online entrepreneurs from all over the world. More than 12,000 eCommerce sites have already been built with its help, and over 10,000 people from 120+ countries who have used this solution now run successful online projects with growing profits. The plugin has proved itself to be a reliable and high demand tool that is quite simple to sell, so it is safe to say that the ideal moment for the start of the company’s own dropship affiliate program has arrived. The new program allows earning money by promoting AliDropship products. It works as drop shipping affiliate programs normally do: first, the new member signs up for a free account and gets a unique affiliate link. This link can be shared through blogs, social media posts, newsletters, etc. The affiliate is awarded a commission for every purchase made through his/her link. AliDropship offers an outstanding 50% commission on every AliDropship plugin sale and 30% for each referral who orders a turnkey custom store or the company’s additional services. When it comes to custom stores, an affiliate can earn up to $284 on one purchase if his/her referral buys the most advanced website package. The dropship affiliate program is free and open to everyone – including those who have never bought anything from the company. AliDropship does not make any tough demands on the people who are eager to become its affiliates. Anyone can take part in the program: from established online business experts, to travel and mom bloggers from diverse backgrounds. Proficient digital marketers and internet users with zero drop shipping experience have equal conditions in the program: it’s only up to each one’s personal activities what their referral numbers and profits will come to. “The demand for AliDropship plugin is really high, since it makes building and running AliExpress drop shipping stores easy and hassle-free. More importantly, this tool allows users to generate high stable income from drop shipping, which is already proved by many thousands of our clients. We feel it’s high time for us to now continue growing together with all the people who want to share our success through this new program. We are rewarding generous commissions to attract as many partners as possible and have no doubts that our new program will become one of the most popular drop shipping affiliate programs on the market,” – shares Yaroslav Nevsky, AliDropship Company’s CEO and co-founder. Let us see what feedback the new partnership program will get from the world’s online business community. AliDropship is an international IT company working in the global market and developing solutions for AliExpress dropshipping. Its primary goal is to help dropshippers worldwide work and earn money through eCommerce. The experienced team of the company draws from diverse professional backgrounds and tailors its services to each client’s individual business objectives. Visit alidropship.com to learn more about the Company and its products.